Wisteria typically are grown in home gardens. 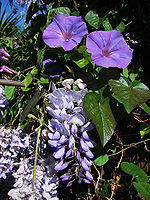 There are two types Wisteria; sinensis or Chinese wisteria, and Wisteria floribunda or Japanese wisteria. Wisteria is an aggressive and strong plant. It can spread easily, but American Wisteria spreads more slowly through seed production though the seedlings have high vigor. Wisteria can grow more than 65 feet in length, and they climb other plants or buildings by twining their stems. Their leaves are alternate, growing 15 to 35 cm long. This plant flowers in spring in the Asian species, while the American species flower in late summer. The leaves are pea-like, and they have different colors; purple, violet, pink or white. The reproduction is both sexual or asexual by layering of stems, which can produce roots. Even though their colors look like purple or bluish-purple, they are mostly like white-flowered form. They can be propagated by softwood cutting, hardwood cutting, and seeds. But seeded specimens can take a long time to bloom, so gardeners help it to grow. The other reason for failure to bloom is excessive fertilizer. Wisteria has nitrogen fixing ability. 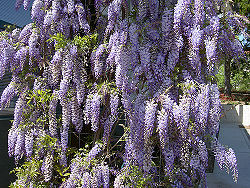 Flowering starts in April, before the Native American wisteria does, and their seeds may be transported through water. 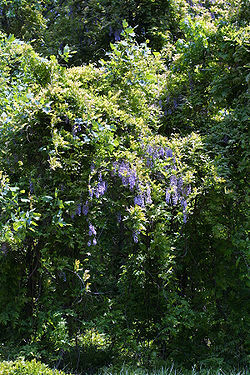 Most appearances of non-native wisteria seem to be the result of the persistence and vegetative spread of former plantings, although, seed propagation is also possible. Wisteria might not bloom, because it hasn't reached maturity yet. Maturation could be only few years for Kentucky Wisteria, but takes nearly twenty years for Chinese wisteria to fully grow. It can be forced to grow by physically abusing the trunk. This page was last modified on 7 November 2011, at 21:08.